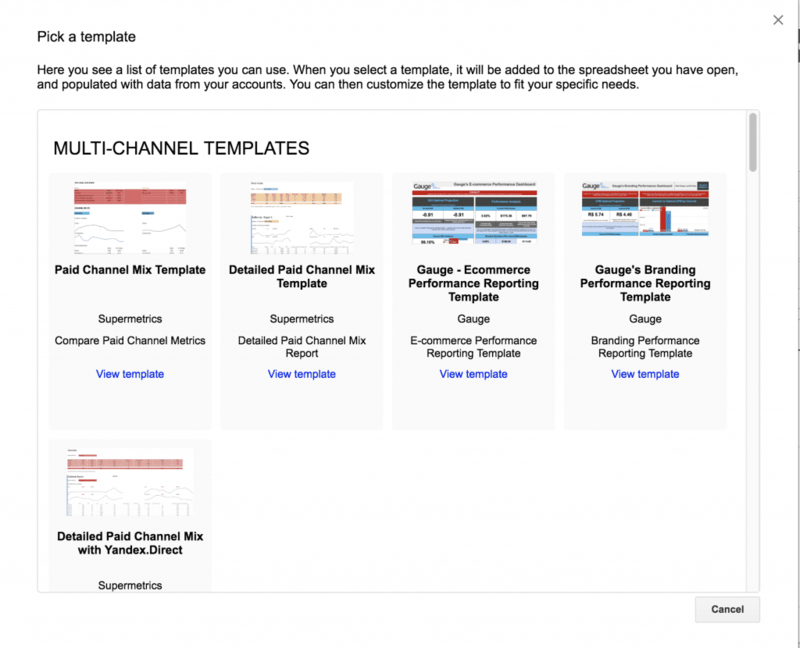 Supermetrics hails itself as the number one marketing add-on for Google Sheets. I don’t disagree. There are many free and paid add-ons out there to aid marketers in improving workflows, automating tasks, and beefing up their ideas and marketing strategies. No doubt, you are likely using many tools to boost your marketing efforts, whether you are an individual or a large team. Supermetrics is a paid service that will help you tie in all of your efforts and improve outcomes. It is a cloud-based software you can use for reporting, monitoring, and analyzing your digital metrics. Gathering all of your digital data is time-consuming and tedious. It can take a long time to gather and crunch the numbers from all of your social media accounts and advertising platforms. On top of gathering the data, you need to store it somewhere, and then produce reports to show your team or your clients. Not only do you or one of your employees need to do these tasks, but you also need to do them right! Yikes. Supermetrics removes some of these tasks from your workflow by automating data import, storage, and reporting. 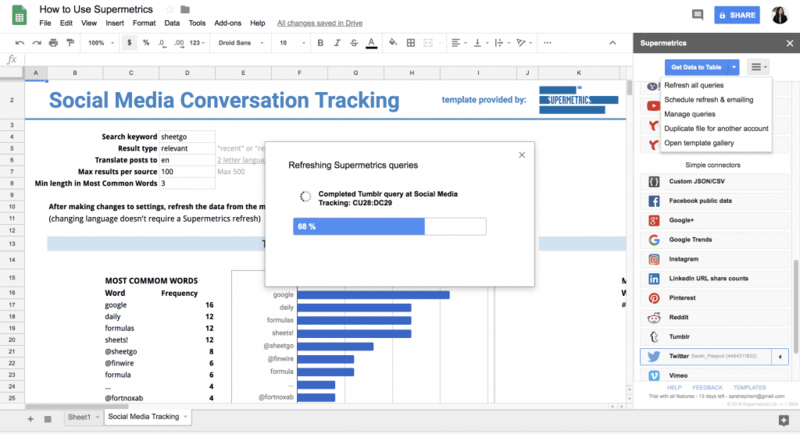 If you use it with Google Sheets, you can use Google’s unique sharing features to automate the way internal and external people can view, comment on, or edit the data and reports. So What Kind Of Data Are We Talking About? Supermetrics can integrate with more than 40 data sources! So whether you are pulling from social media platforms, advertising services, or even your own databases, Supermetrics has you covered! Unlike many types of software, which are ideal for either small or enterprise sized businesses, Supermetrics is great for companies of all sizes. This add-on is used by marketing agencies who want to provide reports to their clients, and by companies of all sizes that have their own marketing department. What Kind of Reporting Does Supermetrics Provide? What is really neat about this add-on is that there is so much flexibility in the kind of insights you can gain using this tool! There are many options out there for reporting using Google Sheets, but not many can offer the kind of simple customization that Supermetrics does. Visualizing advanced data metrics like cross-channel reporting and multi-account budget pacing can significantly transform your business. Cross-channel reporting allows you to see the big picture of what’s happening across all of your digital accounts to really compare what is working and where you can improve. Budget-pacing, whether for single accounts or across multiple accounts, is a super valuable metric to track. Ensure that your dollars are going to the right place and are actually making their mark on your campaigns. This kind of reporting is really valuable when you are managing accounts for other people. New clients can feel nervous handing over huge budgets for advertising and marketing, with Supermetrics you can provide reports that contain both value content and visual appeal so they can easily understand the effectiveness of your campaigns. It is really simple to get add-ons for Sheets! The fastest way to get the SuperMetrics add-on is to click this link that will take you directly to the web store. Simply click the Free button and the add-on will be added to your Google Sheets account. 1. Open a spreadsheet 2. Click the add-ons button in the navigation menu 3. Click the Get add-ons button 4. A window will pop up for you to browse 5. Type “Supermetrics” in the search box. 6. Click the Free button to get the add-on. Now that you have added Supermetrics to your Google Sheets, it’s time to get started using it. Click Add-ons → Supermetrics → Launch. The Supermetrics toolbar will launch on the right side of your spreadsheet. Simply click on any of the logo buttons to connect any of your accounts to your Google Sheets. For this demo, I am connecting to my Twitter account. 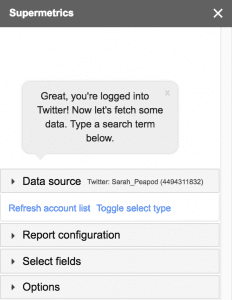 Using the sidebar, you can run queries related to any of your accounts. Next, I will insert a template onto my spreadsheet from the sidebar. Supermetrics offers more than 30 templates that you can use out of the box or customize, or, as you advance, simply create custom templates from scratch. I am going to run a social media conversation template using “Sheetgo” as the keyword. 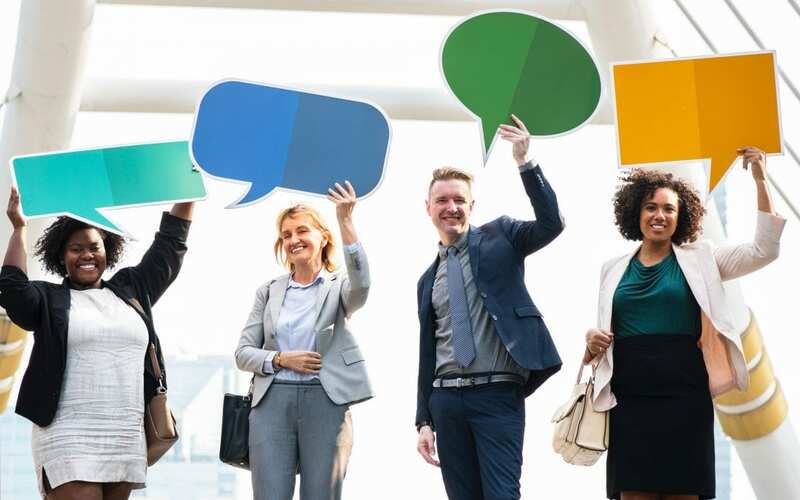 Within a few minutes, Supermetrics has gathered data from the web and provided a detailed report about who is mentioning Sheetgo around various social media platforms. These are just a few of the basic things you can do with Supermetrics. The options and insights are nearly limitless, and you will need to tailor your solution to you. Supermetrics offers great guidance from within the add-on, and also on their forum and solutions page.